In my previous tutorial I have explained How to do Authentication of Users in Identity in ASP.NET Core. Now I will extend it with Identity Roles. 1. Admin – For doing administration works like assigning work to employees. 2. Managers – For looking after the client needs, and completing projects on time. 3. Network – For keeping the internet of the organization, up and running, in secured manner. 4. Security – For guarding the premises of the organization. In ASP.NET Core Identity System you can create any number of Roles and assign users to these roles. For accessing and managing roles you need the help of RoleManager class. T is the class that represents roles in the Identity Database. 1. Id – gives a unique identifier of the role. 2. Name – defines the name of the role. 3. Users – It returns a collection of IdentityUserRole objects that represents members of the role. In the Role Controller class, I have added a dependency of RoleManager class to the Constructor. The RoleManager class is used to manage the Roles in Identity, and has the some important functions and properties which are defined in the table given below. The ‘role’ is an object of type IdentityRole. This View takes a model of type IEnumerable. I will loop through all the roles, using the foreach method, and show them in the table. This attribute will call a Custom Tag Helper which will modify this td element to display a list of all the Users who are members of each Role. id of the role that is being processed. 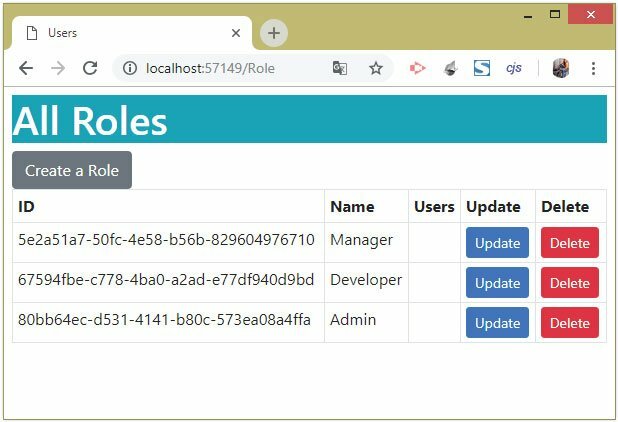 The RoleManager and UserManager objects fetches a list of all the users that resides in a given role. 1. I can refer to the ‘Microsoft.AspNetCore.Identity’ namespace in the views without using a namespace. 2. I can use my custom tag helper in the Views. It takes the Role name from an Input control in the View and uses the CreateAsync method to create the View. 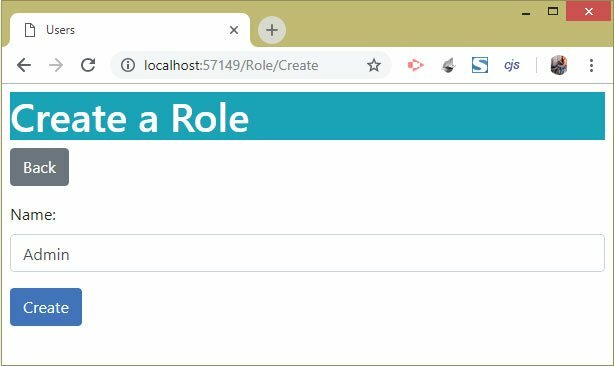 Run your project and go to the create role URL – ‘/Role/Create’. Once you create a role you will be redirected the Index View, which will show all the Roles in your Identity System. Now I will create a functionality to add or remove users from Roles. For implementing this functionality add 2 classes called ‘RoleEdit.cs’ and ‘RoleModification.cs’ in the ‘Models’ folder. The RoleEdit class is used to represent the Role and the details of the Users in the Identity System. The RoleModification class code represents the changes that will be done to a role. I will now use these 2 classes to add or remove users from a role. For this I will add ‘Update’ action method to the Role Controller. Notice I have added a dependency of UserManager class on the constructor. 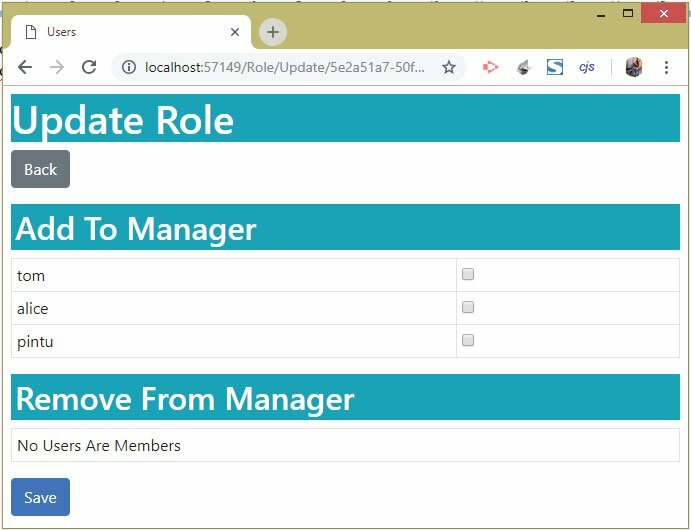 The Get version of the Update Action method is used to generate members and non-members of a selected role. While the Post version of the Update Action method is used for adding or removing users from a role. 1. For users who are ‘non-members’ of the selected role. 2. For users who are ‘members’ of the selected role. A checkbox is given against each user’s name, and through this checkbox the users can be added or removed from the selected role. To test the Update Role Feature, where you will add or remove users from a role, you should have 3 roles created from the URL – ‘/Role/Create’. Next, click the ‘Update’ button of the Manager’s role once more. 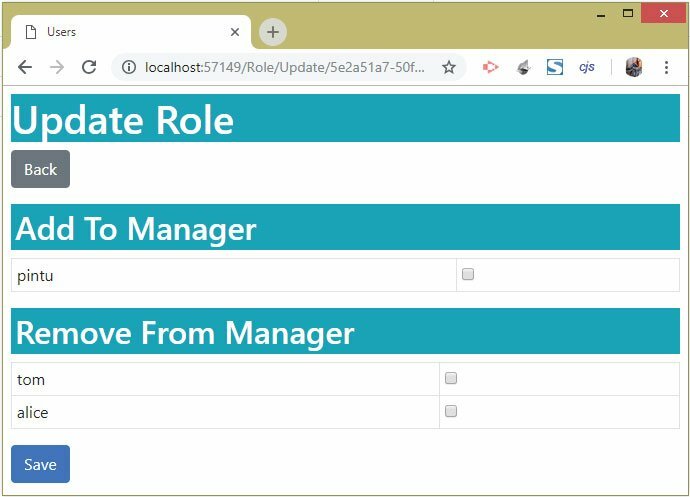 You will now see user ‘pintu’ shown inside the heading ‘Add To Manager’, and ‘tom’ & ‘alice’ shown inside another heading ‘Remove From Manager’. Note that a user can be added to multiple Roles, like tom can be added to all the roles of the Identity System. Roles can be use with the [[Authorize]] attributes to specify that all Users of the selected Role can only access the Action method. 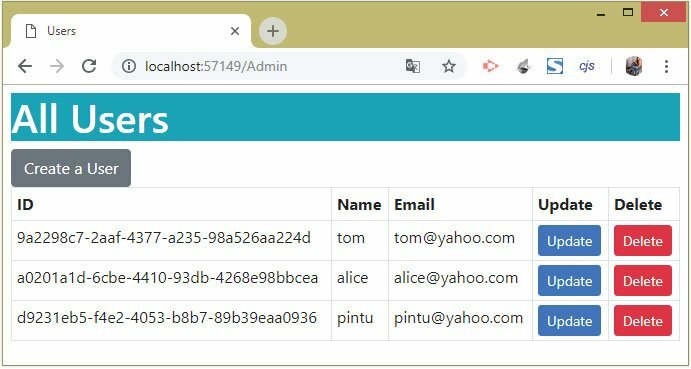 Run your application and login with user’s ‘tom’ credentials. Everything will work fine since user ‘tom’ belongs to the ‘Manager’ role. If you had logged in with user’s ‘alice’ credentials then you will not be redirected to the Index Action of the Home Controller. This is due to the fact that ‘alice’ does not belong to the role of ‘Manager. You will instead be redirected to the access denied URL – ‘Account/AccessDenied’. The ‘/Account/AccessDenied’ URL is the default URL set by Identity which you can change by setting the AccessDeniedPath configuration property in the ConfigureServices method of Statup Class. Remember: If you change the roles for the user you are currently authenticated as, the changes won’t take effect until you log out and authenticate. 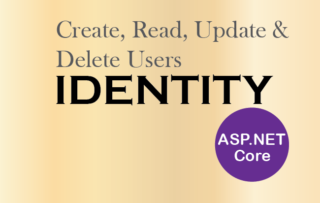 This completes the tutorial on Roles in Identity and now you are in a position to upgrade your website to include Identity Roles and authentication of users based on these roles.